I offer private one on one or one/two instruction also. My experience is very widespread, and I have experience in trout, bass, panfish, and saltwater fly patterns. I have 20 years of experience sharing fly patterns, teaching, and tying flies commercially for sale. As with my other lessons, if you have have your own tools and would prefer to use them,please feel free to do so. If you do not currently own tools, I can provide them. I can teach you an entire fly, group of flies, or maybe a specific technique that you maybe want to learn, improve upon, or maybe you are having trouble with. I tie and teach all types of dry flies, nymphs, wet flies, streamers, poppers, bass bugs, and saltwater flies. 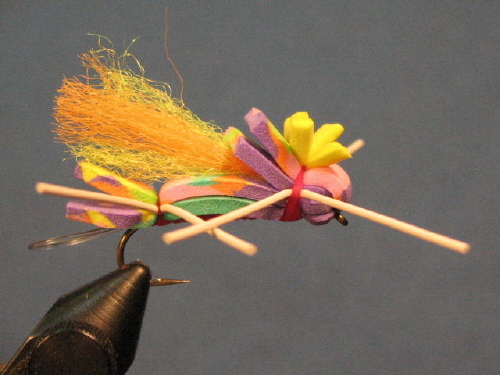 More importantly,I can teach you to tie special flies you find just anywhere. Many of the patterns I teach are of my own design, flies that have proven their worth on the water, under a variety of conditions. They are patterns I have literally made a living on. I’d love to share some with you!!!! BWO CDC emerger, then to the sulphur version, and they just ate, and ate, and ate. Basic Fly Tying – This private lesson format includes the basic techniques and materials needed to tie the four basic types of trout flies—nymphs, streamers, wets, and dries; covers traditional patterns such as the Gold-ribbed Hare’s Ear, the Pheasant tail, the Tellico, the Bead Head Wooly Bugger, the March Brown wet, the Foam Ant, the Foam Beetle, the Elk Wing Caddis, and the traditional Light Cahill. This lesson is available from 8:00am -9:00pm and lasts approximately 3-4 hours, depending upon how fast we tie. I supply the materials as well as directions to tie the patterns, all of which is yours to keep, of course, after our lesson is over. This private lesson is designed to give the student an opportunity to get help with a specific problem. Dry fly wings, tails, bodies, hackle, thread management, spinning hair, you name it. I am experienced with and have taught most types of fly patterns and can usually help you. Also, I will provide all needed materials for the custom lesson. This lesson is available from 8:00am – 8:00pm and lasts 2-3 hours depending upon the type of lesson it is. Types of Lessons include Tying Terrestrials, Tying Bead Heads, Tying Trout Streamers, Tying Attractor Dry Flies, Tying Basic Dry Flies, Tying Smith River Flies, Tying TN Tailwater Flies, Tying Basic Nymphs, Tying Flashback Nymphs, Tying Micropatterns for Trout, Tying Midges, Flies for NC Stripers, Flies for Redfish/Speckled Trout, Flies for Albacore and Bonito, Flies for Panfish & Bass.